We live our lives in three time zones—past, present and future. Each day we work to reconcile those three. Our present is made up of statements—the retreat group needs feeding, the emails need answering, the buildings need cleaning—those things without which camp wouldn’t function. These pressing needs are driven by the past. The past brings us questions. How can we serve this church better than the last time they were here? What would make our staff training more beneficial based on last summer’s program? What buildings need to be cleaned based on last weekend’s retreat? Perhaps my favorite time zone is the future. The future is made up of “what ifs,” of sentences without endings, of questions without answers. It is a place where all things are possible, where all dreams could come true, where camp could change in ways we’ve never imagined. So in the midst of answering yesterday’s questions and fulfilling today’s statements, we get to dream together as a staff and as a camp community. Some dreams are so close we can taste them and some dreams are decades down the road, if they ever come to fruition. But camp thrives on dreams. It is through yesterday’s dreams that we reach the families we do today. And it is today’s dreams that will pave the way to continued life change tomorrow. We have something better than dreams, though. We have a God that delights in our dreams and enables us to fulfill some dreams we have and some dreams we have never even considered. Recently, our camp family grew. We have had the pleasure of hiring Jesse and Jo Barriga and their two beautiful children as our marketing and guest services directors. This growth gives us new insight into our past, new hands for our present, and above all new imaginations to dream for the future. Together, we have spent these last two months praying, dreaming, and planning. 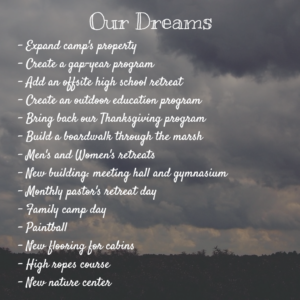 We want to share some of those dreams with you because camp is more than just the full-time staff. It is more than the summer staff and even more than the campers. 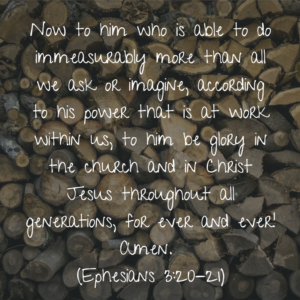 It is a whole community of staff, of campers, of churches, of families, of prayer warriors, without whom we could not continue to serve God and this community. We ask you to join with us as we dream. We want our excitement for the future to overflow to you and your families. We want to hear your ideas for what camp could look like in a year, in ten years, in fifty years. We want to pray together for camp’s future, whatever that may look like—that it would be a future honoring to our Savior and one that allows us to continue to create opportunities for life change through the love of Christ.